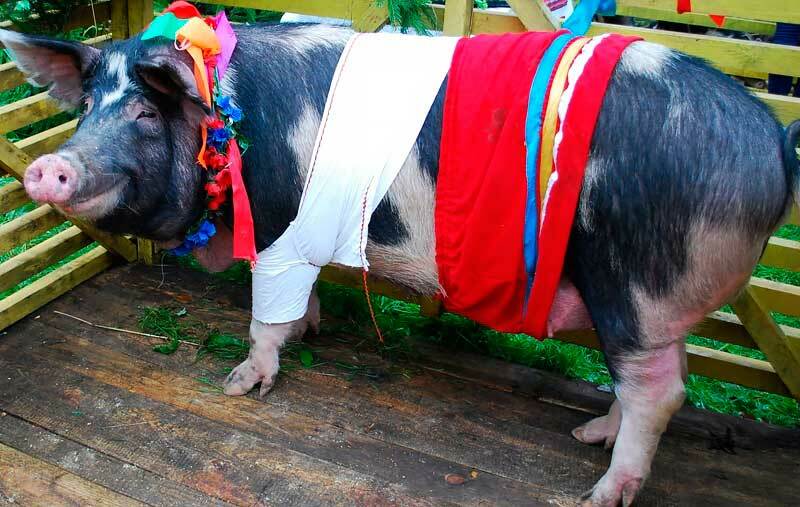 Myrhorod Pigs are a lard-type pig breed from Ukraine. They were the second domestic breed of pig developed in Russia. Myrhorod Pigs are the result of prolonged planned work by a large collective of scientists, specialists, and workers of collective and state farms. They were developed through crossing of local black-ruffled pigs with Berkshire, medium white, partially large white, Temvorskaya, and large black pigs. Boars have an average live weight of 290 kg, a trunk length of 180 cm, and sows weigh 235 kg and 162 cm long. Their heads are medium-sized, not coarse, snout of moderate length, and their ears are mostly short, standing, sometimes they are inclined forward. Their body is wide, with well-filled hams. Their skin is elastic, not rough, without folds. Their bristles are shiny, long, and dense. Their feet are of moderate height and strong. They are black and pockmarked, with a predominance of black spots, black with a rusty color, and sometimes with a white belt under their shoulder blades and on the front legs.